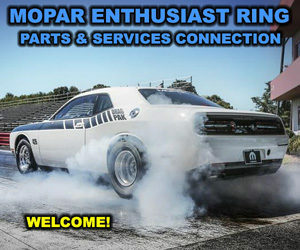 Welcome, the Parts & Services Connection features member sites of the Mopar Enthusiast Ring that offer parts or services for Chrysler, Dodge, Plymouth, Jeep, RAM owners and Mopar enthusiasts. We’re proud to offer a connection just for the Mopar Business Community. Own a business or commercial site offering parts and or services for Mopar owners and enthusiasts? The connection was built to showcase Mopar related business sites like yours. Membership is free, you only need to provide a link back to the Mopar Ring. By joining, your business will become a member of the best resources on the internet devoted to Mopar enthusiasts. For visitors, the parts & services connection a valuable resource on what companies offer for our Mopar related vehicles. The business member site list and the Mopar Enthusiast Ring member search are great resources to locate business sites offering parts or services for Chrysler, Plymouth, Dodge and Mopar related vehicles including the adopted brands of AMC, Jeep, Eagle etc. Online for over 20 years the Mopar Enthusiast Ring is one of the internets oldest and largest Mopar resources. The ring specializes in promoting Business, Club, and Personal Mopar sites. Our site is a great resource for locating owners, clubs, information or parts & services on the WWW for your Mopar related vehicle. The mopar-ring.org server also hosts some other cool Mopar related resources & connections.